Q Why aren't weddings held at temples? A There are some weddings that are held at temples. 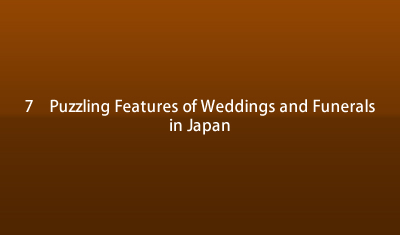 Of all the weddings in Japan, roughly 2% are held at temples. However, the image of temples as a place for holding funerals first comes to mind and many Japanese are not receptive to the idea of holding auspicious events like wed-dings at temples. Originally, temples served not only to officiate at death but also as a place where Buddhist priests trained. Temples have also taken root in the community and have served in the daily lives of the common people by being a place where they could come into contact with Buddhism. There are few people nowadays who use temples as a place of worship. Many people regard temples as a place to visit for their historic significance or because they see temples as simply a place to pray for the repose of the dead. The foremost meaning of hotoke (Buddha) is the "Buddha" or "Buddhist image," but it also takes on the meaning of "a deceased person" or "a deceased person's spirit." The household altar in homes is where the memorial tablet of the deceased is enshrined. Temples and Buddhism seem to have too strong a connection to the dead. A Zen temple is a place to undergo spiritual training through zazen (zen meditation). Zen has a following even among people in the younger generation, but even then, very few people would choose to hold a wedding ceremony at a Zen temple.